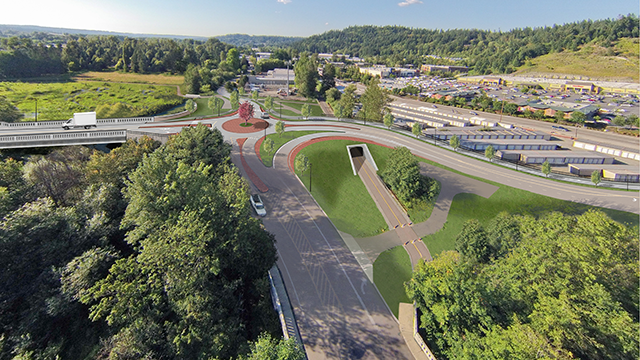 Issaquah recently made a major improvement to its northern road network by extending Southeast 62nd Street between 221st Place and Lake Drive (see project map). Added two roundabouts where 62nd Street intersects 221st Place and Lake Drive. Widened Southeast 62nd Street between East Lake Sammamish Parkway Southeast and 221st Place Southeast. Added new sidewalks, bike lanes, curbs and gutters, curb ramps and street lights. Made upgrades along the East Lake Sammamish Trail so that users will no longer have to stop, or interact, with vehicles at Southeast 62nd Street. Preserved close to six acres of property between the north fork and main stem of Issaquah Creek, which were previously zoned for multi-family development. Constructed two acres of wetland. Made enhancements to the North Fork of Issaquah Creek. Construction for this complex project, which included building a bridge, roundabouts and other infrastructure, started in March 2017. The road and trails are now open, although users can still expect some minor delays as crews complete the project. To receive more information about the Southeast 62nd Street project, please sign up for regular updates.